My name is Alicia D. Webb and I am 41 years young. I was born in Detroit, MI and migrated to Atlanta for college. I am a High School Math Teacher of 17 years and an Adjunct Professor at Clark Atlanta University where I teach teachers working towards receiving their master’s degree in Math Education. I just renewed my National Board Teaching Certificate and encourage all I come in contact with to be the best at whatever they do. I volunteer with Singles for Christ uplifting our elderly confined to Nursing Homes and with “Cupcakes and Cocktails for a Cause” fulfilling children in violence/Abuse and homeless shelters Christmas wish lists and back to school bookbag / supplies. I also tutor our youth at Wings of Faith Worldwide Ministries. I am a child advocate determined to give every child a voice!!! I believe to be blessed you must be a blessing to others. I live in Lithonia, Ga and I train at Crossfit Decatur with Ben Benson in Decatur, GA.
3. What are your hobbies (other than powerlifting)? I love exercising, gardening, cooking, decorating, sewing, shooting pool, bowling, reading, swimming, shopping, teaching, helping, communicating, and fellowshipping. 4. Are you involved in powerlifting in any way besides as a competitor? In everyday workouts for Crossfit, I power lift. 5. Is there anything about powerlifting you would like to change or wish was different? 6. What is something that most people don’t know about you? I write poetry and I love making/building/fixing/installing things that are reserved for professionals. 7. What is your occupation? Does it interfere with competing or visa versa? I am a teacher and life learner. . . Not just in the classroom but in every aspect of my life. Teaching and competing coincide as well as clash. . . But you learn to make things fit and work together!!! 8. How did you get into powerlifting and how many years have you been competing? I joined my Crossfit Decatur (CFD) gym about 8 years ago (first called Son’z Fitness) and was introduced to powerlifting. . . I realized that I was strong in this area and my trainer decided we should see what my maxes in the different exercises were. . . When my numbers put me in the elite category for Crossfit, I decided to explore the possibilities of getting stronger. I have only competed over the past 3 months. 9. What are your biggest squat, bench press, deadlift and total numbers? 10. What titles, records and achievements have you accumulated during your powerlifting career? 11. Can you describe your training philosophy and/or a typical training session? I never know what I am doing prior to walking in the gym. I have found that if I know beforehand, I think too much on it and defeat myself. Once I walk in the gym, I go and start my warm-up. It takes me about 20 mins to warm-up. Somewhere in that time, my coach Ben Benson tells me what I am doing for the day. Sometimes I am lifting in a group but most times I am lifting by myself on a platform. If lifting by myself, crossfitters warming up watch and encourage me!!! I play gospel music while I lift which keeps me focused and centered. My coach is within eyesight and he monitors sometimes making changes to what I am doing depending on how I am looking. I fight to get everything done. It is sometimes more of a mental battle than a physical one, but my fellow crossfitters are usually there to keep me moving and focused. It truly takes a community to progress. . . I am very thankful for mine!!! 12. Do you compete equipped (squat suit, bench press shirt & deadlift suit) or unequipped (no suits) or both and what weight class(s) and divisions(s) do you compete in? I compete unequipped (RAW) in the 198 weight class, Open & Masters (40-44) division. 13. What is your favorite lift, squat or bench press or deadlift or all three and why? 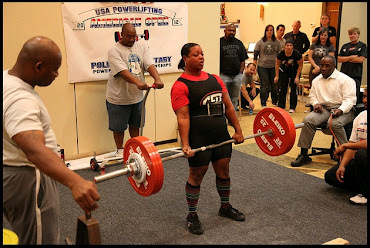 2012 USAPL American Open – I failed 2 squat lifts and 1 bench press lift. . . Set personal records in all 3 lifts and total. . . set several American Records. . . and won Best Female Lifter. Yes, 2013 Battle of the Borders on March 23 in Fort Mills, SC. 18. How do you prepare for an upcoming competition? Describe each aspect that you focus on as you prepare for a competition. I do whatever my Coach tells me to do. . . Pray, train, eat clean, eat breakfast, sleep well, have fun, journal, tell the truth of how my body feels (communicate the good, bad and ugly) and get massages. Don’t forget to have fun!! 19. Is there anything you will do differently to prepare for your next competition that is different from your last one? 20. How many competitions do you compete in each year? I am new at it. . . but this year I have competed twice, maybe 2-3 next year. 21. Who is your greatest competitor/rival and why? My biggest competitor is myself!!! I see no one else and hear no one else. . . I am always in my head!!!! I love to encourage everyone. . . But I only compete against “the me” of previous days!!!!. . . My philosophy is that there is always room for improvement. . . and everyday, I must be and do better than the day before!!!! 22. What advice & tips would you give to a powerlifter that is just beginning? If you are just beginning, what advice have you received from other lifters or coaches? Advice to be given is to stay focused and keep positive, get a good coach/trainer and train often, perfect the form and technique. Watching the video of your lifts will correct a lot of issues!!!! Warm up and cool down is priority. . . Have fun. And always listen to your body. . . It knows best!!!! 23. How has powerlifting changed your life? It has definitely made me more disciplined and focused. 24. Do you stay in touch with lifters you compete against? 25. What is your #1 or most prestigious meet you ever competed at in your career? 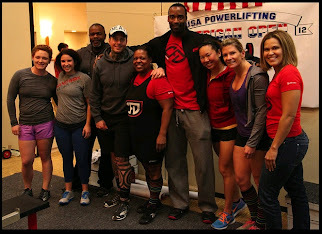 The 2012 USAPL American Open, Dec 1st in Atlanta, GA.
26. Do you compete in any other strength sports such as Olympic lifting, strongman, highland games, etc? 27. What is your favorite memory from any powerlifting competition or event? 28. Do you see yourself still competing in ten years? If so, what are your goals for ten years from now? I don’t know what the future holds. I will continue to do my best with whatever time I am allotted. If I am still lifting in ten years, my goal will still be to improve my personal records without injury. 29. Do you have any funny or interesting powerlifting stories that you can share with us? My Coach Ben Benson tightened my belt to the last holes as I was going out to attempt my final deadlift. I had to readjust my breathing as he was telling me what he expected of me in this lift. After the spotters loaded the bar, I walked over to the bar and was having a hard time bending to the bar and breathing properly at the same time. Little did I know, my coach was having a hard time breathing as well. He was kneeling on the floor in anticipation of my lift. As I lifted the bar in slow motion, struggling to get the weight up, my coach’s body raised off the floor as if he was the bar I was lifting. As I laid back into my lift the audience went crazy, but my coach did a slow stiff turn (like the girl in the exorcist movie) to look at the judges lights. When all 3 white lights went off he jumped and screamed, while making his way over to me. He thought I was speechless and emotionally elated from winning the American Open and had not paid attention to the fact that I was pointing to my belt. As some of the other lifters started to pay attention to me, 3 crossfitters from Crossfit Johns Creek came to my rescue and released me from my belt. As the belt fell to the floor, so did I gasping for air, while seeing the black dots start to close out my peripheral vision. After catching my breath, I was able to share in the glory of a win. 30. Anyone you would like to thank for helping you along the way in your Powerlifting career? Yes, Chuck Carswell for helping me to find my maxes and encouraging me to get stronger while convincing me that I would not bulk up like a man. Thanks to Eric Willis for believing in and pushing (forcing) me to compete in my first meet, opening the gym for me early to train, supporting me during the meets, and bringing our community together to celebrate the accomplishments of all the hard work. Ben Benson for coaching/training /programming/ advising/ lifting/ supporting/ critiquing/ believing/ driving and encouraging me to be my best, and then helping/reminding me to center myself just when I needed it the most. Thanks to my Crossfit Decatur family for the encouragement while I am training. To my LS Nikki Thornton. . . Thanks for always having my back!!! And To God be the Glory. . . He is where my strength lies. 31. Is there anything else you would like to add? Right before and during my lifts, I am always looking up (but in my head I am praying for his strength). Look to the hills from which cometh my help (strength), all my help (strength) comes from above.